...And we have a winner. 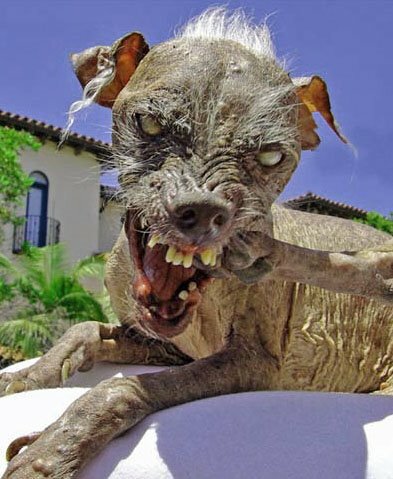 Named for Sam, the late purebred Chinese crested hairless that won the "World's Ugliest Dog" Contest three years running until his demise (by all rights, he should definitely have retired the prize), T.O.P. hereby awards the Sam Memorial Dog Camera Award for World's Ugliest Camera to the Simmons Brothers Omega 120, the early American precursor to the Koni-Omega. 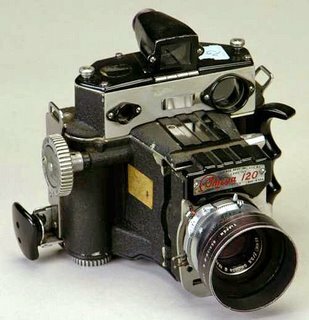 It is a sad thought indeed, but the world may never see an uglier camera. Mere tastelessness cannot reach such heights, and the sameness encouraged by modern manufacture will probably doom such Rube Goldberg contraptions. R.I.P. Thanks to the two commenters who nominated it! My lord... I dont think I can handle this. It's threatening. An inspired choice for both the winner and its namesake. Is it me or can you almost see a little of the dear, departed Sam in the Simmons Omega? From reading about the camera, it takes good photographs. That's a good thing because it has a "face" only a mother could love. Dang, I forgot the Argus brick and the Graflex XL with the self-mutilating plastic lens mounts. Or my Brooks Veriwide whose chrome sluffed off. But a fine choice all the same. Now that is UGLY! Intriguingly ugly. Looks like something that came out of the Starwars bar! As ugly as that thing is, I seem to see the grandfather (or possibly 2nd cousin) of my lovely Koni-Omega Rapid 6 X 7 lurking in there somewhere. Ten thousand comedians out of work and all of these amateurs…. So, she may be pretty ugly and, she may be getting pretty cantankerous in her old age but, she still make a pretty nice negative, and you know what Momma used to say…. Ugly! yes. But it handles beautifully. It is well balanced, comfortable an absolute delight to use...And it creates the best photographs of any camera in my vast collection. In addition it is built like the proverbial brick S---house, and can be easily repaired should thye necessity arise. What more can you ask for? Good Jesus that is hideous. Where can I buy one? I thought when I first saw it, I thought it that it had to be a joke...that someone intentionally set out to build a camera this ugly, but the fact that it's a real production camera gives this puppy an even stronger "truth is stranger than fiction" gestalt. Additionally, this is one of the funniest threads I have read in quite a while...one of the good reasons to stop by every day to see what's up at TOP. where is the duct tape? No, not ugly at all. Its beautiful really, and incredibly functional for its time. Is that your camera? would be interested in acquiring it!